FILE - U.S. President Donald Trump an event at the Harrisburg International Airport in Middletown, Pennsylvania, Oct. 11, 2017. The United States' key military allies in Asia are expected to focus on areas of mutual agreement when President Donald Trump makes his first official visit to the region. On November 3, President Trump will embark on a 12-day trip to Japan, South Korea, China, Vietnam, where he will attend the Asia-Pacific Economic Cooperation (APEC) summit, and the Philippines. During his meetings with leaders in the region, President Trump plans to advocate for increased international support to pressure the Kim Jong Un regime in Pyongyang to give up its nuclear weapons and ballistic missile programs. FILE - A woman watches a TV screen showing a file footage of North Korea's missile launch, at the Seoul Railway Station in Seoul, South Korea, Sept. 15, 2017. 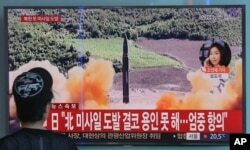 Preventing North Korea from developing a nuclear intercontinental ballistic missile (ICBM) that could reach the U.S. mainland has become a top national security priority for Trump. “He has raised all kinds of expectations about what he’s going to do about North Korea. And if he doesn’t do those things then it seriously threatens his identity, it undermines him, it undercuts him,” said John Delury, an international relations professor at Yonsei University in Seoul. The United States recently worked with China and Russia in the United Nations to pass tougher economic sanctions that could reduce North Korean trade by 90 percent and oil imports by 30 percent. 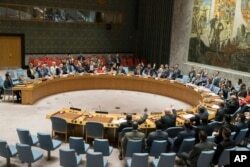 FILE - The United Nations Security Council votes on a new sanctions resolution that would increase economic pressure on North Korea to return to negotiations on its missile program at U.N. headquarters, Aug. 5, 2017. The U.S. has also imposed secondary sanctions on international companies that do business with the Kim Jong Un regime, and is urging other countries to ban North Korean workers and restrict diplomatic ties with Pyongyang. North Korea has defiantly responded to sanctions by accelerating missile and nuclear tests, and has defended its need for a nuclear deterrent to prevent a U.S.-led invasion. However U.S. military allies Japan and South Korea have been split over Trump’s emphasis on the possible use of military force and his threatening “fire and fury” rhetoric to “totally destroy” North Korea if provoked. FILE - Pedestrians look at a television screen broadcasting a news report in Tokyo, following a North Korean missile test that passed over Japan, Sept. 15, 2017. In Japan, Trump will meet and likely play golf with Prime Minister Shinzo Abe, perhaps his closest friend in Asia. The two leaders established a close professional relationship when the prime minister visited the newly elected president prior to his inauguration. “President Trump and Prime Minster Abe also agree on a number of issues including in particular on the North Korea problem,” said security analyst David Straub with the Sejong Institute. Public support In Japan has coalesced around Prime Minister Shinzo Abe’s strong stance on national security after North Korea fired two intermediate range missiles over Japanese airspace and threatened to "sink" Japan into the sea. Promising to counter the North Korean threat by increasing military deterrence and strongly aligning with U.S. policy on North Korea, Abe’s conservative coalition won a decisive victory in an early parliamentary election held this week. Japanese Prime Minister Shinzo Abe, right, leader of the Liberal Democratic Party, poses with vice president Masahiko Komura for photos as he marks on the name of one of those elected in the parliamentary lower house election at the party headquarters. But officials in Tokyo have also been careful to downplay the possibility of a U.S. preventive military attack on North Korea, and have quietly indicated that the threat of military force is a diplomatic tactic to extract concessions from China and North Korea. “I suspect Prime Minster Abe too would not want to see, if at all possible, any major conflict on the peninsula, because that would carry enormous risks that are quite unpredictable for Japan as well,” said Straub. The Japanese prime minister and U.S. president will also likely downplay differences over trade. 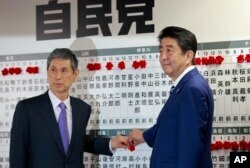 Abe still hopes to resurrect some form of the Trans-Pacific Partnership (TPP) multi-lateral trade deal. Trump withdrew from the TPP and has indicated a preference for developing bilateral trade agreements that will produce more U.S. manufacturing jobs. South Korean President Moon Jae-in is also expected to emphasize his country’s longstanding “ironclad” U.S. alliance when he meets with Trump in Seoul. 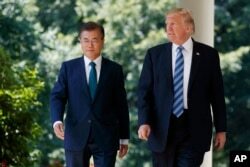 However, the liberal South Korean leader has struggled to reconcile his emphasis on dialogue and engagement with Washington’s hardline position. Moon strongly opposes any use of military force on the Korean Peninsula, particularly a U.S. first strike on North Korean nuclear or missile sites. Analysts say a preventive strike would likely provoke a retaliatory attack against the millions of people in Seoul who live within range of North Korean artillery at the border, and may also escalate into a devastating, regional nuclear war. “I think Trump’s visit is an opportunity to educate him in terms of how South Koreans see this, and the fact that South Korea has been living under a credible threat of nuclear attack for a while now, and we are all doing fine,” said Delury. Trump has characterized Moon’s efforts to engage North Korea in dialogue as unworkable appeasement. For now, differences between Seoul and Washington have been muted in the face of North Korea’s continued missile and nuclear tests, and Pyongyang’s refusal to engage in inter-Korean talks or even accept offers of humanitarian aid from the South. Trump has hinted he may visit the demilitarized zone (DMZ) between North and South Korea, as most visiting U.S. leaders, including former Presidents Barack Obama and George W. Bush, have done. But no such plans have been confirmed. 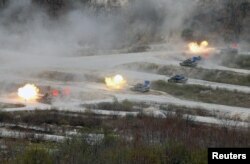 FILE - South Korean Army K1A1 and U.S. Army M1A2 tanks fire live rounds during a U.S.-South Korea joint live-fire military exercise, at a training field, near the demilitarized zone, separating the two Koreas in Pocheon, South Korea, Apr. 21, 2017. The president is scheduled to visit the recently expanded Camp Humphreys, located south of Seoul, which will become the main headquarters for U.S. forces in Korea. President Trump is also expected to address the U.S. trade deficit with South Korea and argue for renegotiating terms of the U.S./South Korea Free Trade Agreement. Officials in Seoul say the trade deal has helped both economies and that South Korean investment in the United States has generated many American jobs.